Overhead Conveyor with Automatic Dumping Station for Tire Recycling Plant Emterra Tire Recycling (ETR), formerly called Canadian Eco Rubber Ltd. is located outside of Toronto, Ontario. Emterra is part of a growing industry that collects, processes and recycles used tires into innovative new products. Since 2009 Ontario tire recyclers such as Emterra have helped create a multi-million dollar industry and thousands of new jobs while diverting over 50 million tires from landfills. Emterra Tire Recycling accepts both used and scrap tires. At their plant near Toronto, about 10% of the tires they receive still have some life left in them which means they can often be re-used before reaching the end of their useful lives. Tires considered scrap go straight to recycling where they are shredded into rubber mulch or crumb rubber and then sold to make a wide range of useful products. Whether they are suitable for re-use or considered scrap, the tires that come to the Emterra Tire Recycling facility are never stockpiled or placed in landfills. When Emterra contacted Pacline Overhead Conveyors they were looking to improve efficiency in their sorting and recycling plant. They wanted to increase the tire throughput by 40% a day without adding personnel. EMTERRA had been using a belt type conveyor system to carry scrap tires from the delivery truck to an area above the floor where the tires were dumped into a giant hopper for shredding. One inefficiency in their system was at the truck unload area. Here, personnel were required to identify the tires for re-use and manually pull them aside. In fact, they had up to 5 personnel rolling the non-scrap tires to an accumulation area on the floor. This system also caused considerable congestion on the floor area of the facility. The PAC-MAX™ has an enclosed track design which protects workers from possible pinch points since the moving chain is enclosed within the track. And, the PAC-MAX™ can handle a tighter radius in vertical bends for quick elevation changes – getting the system up off the floor quicker would save valuable floor space. An I-beam conveyor system would not work within the tight layout of the facility. Emterra’s Engineering, Maintenance and Safety personnel attended a demonstration of the PAC-MAX™ heavy duty conveyor at PACLINE’s testing facility. Here they had the opportunity to fully understand the benefits of the various overhead conveyors for their tire recycling application. Once the conveyor concept was agreed to, PACLINE designed and tested a dumping station with custom carriers designed to handle the specified tire size and weight. PACLINE engineers often use solidworks drawings to design and demonstrate unique conveyor system features such as this tire dumping mechanism for Emterra. At the truck unload area, tires are visually inspected for usability. 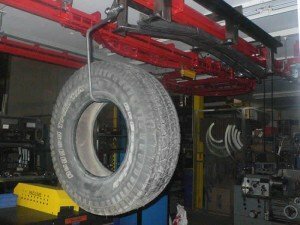 Any tires that appear to be in good condition are loaded onto individual carriers and transported using the PAC-MAX™ system up to the mezzanine area. The height of the carriers was reviewed with the customer to ensure they were ergonomically correct for the person loading the tires. 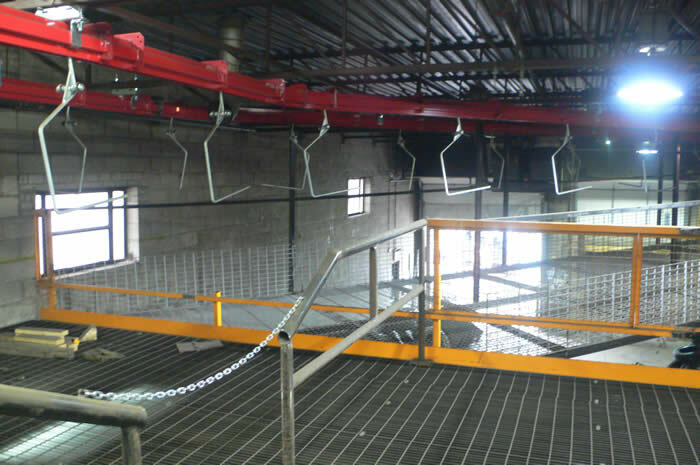 Once the tires reach the mezzanine area, they are unloaded, tested and closely inspected. Those tires that pass all inspections are flagged and retained for re-use. The remaining, roughly 90% of all tires received, are considered scrap. These scrap tires are placed back on the hangers and continue on the PAC-MAX™ conveyor system until they reach the automatic dumping station and the first stage of shredding. The automatic dumping mechanism was a custom design feature for the EMTERRA system. Scrap tires are automatically released from the conveyor and dumped onto a large belt conveyor which delivered the tires directly into the shredder. Reduced manual labour and operator fatigue. Increased throughput from 3500 to 7000 tires per day. Ever wonder what happens to all that tire material when it gets recycled? 100% of every tire is recovered and recycled. For every 22 pounds of scrap tires that Emterra recycles, they recover: 12 pounds of high quality crumb rubber, 6 pounds of steel and 4 pounds of fibre (polyester and nylon). All recovered materials are sold to be used for manufacturing new products.